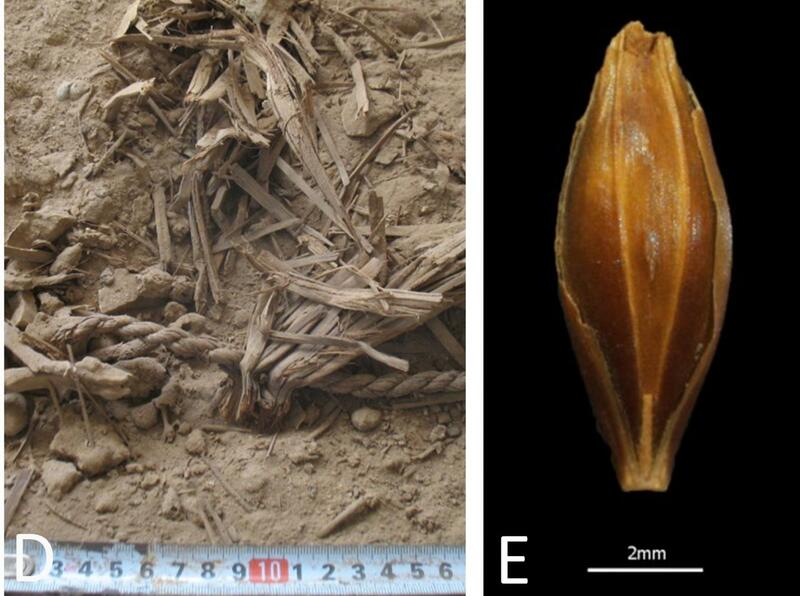 Left: A well-preserved, desiccated barley grain found at Yoram Cave An international team of researchers has succeeded for the first time in sequencing the genome of Chalcolithic barley grains. This is the oldest plant genome to be reconstructed to date. The 6,000-year-old seeds were retrieved from Yoram Cave in the southern cliff of Masada fortress in the Judean Desert in Israel, close to the Dead Sea. Genetically, the prehistoric barley is very similar to present-day barley grown in the Southern Levant, supporting the existing hypothesis of barley domestication having occurred in the Upper Jordan Valley. "These archaeological remains provided a unique opportunity for us to finally sequence a Chalcolithic plant genome. The genetic material has been well-preserved for several millennia due to the extreme dryness of the region," explains Ehud Weiss, of Bar-Ilan University. In order to determine the age of the ancient seeds, the researchers split the grains and subjected half of them to radiocarbon dating while the other half was used to extract the ancient DNA. "For us, ancient DNA works like a time capsule that allows us to travel back in history and look into the domestication of crop plants at distinct time points in the past," explains Johannes Krause, Director of the Department of Archaeogenetics at the Max Planck Institute for the Science of Human History in Jena. The genome of Chalcolithic barley grains is the oldest plant genome to be reconstructed to date. Wheat and barley were already grown 10,000 years ago in the Fertile Crescent, a sickle-shaped region stretching from present-day Iraq and Iran through Turkey and Syria into Lebanon, Jordan and Israel. Up to this day, the wild forms of these two crops persist in the region and are among the major model species studied at the Institute of Evolution in the University of Haifa. "It was from there that grain farming originated and later spread to Europe, Asia and North Africa," explains Tzion Fahima, of the University of Haifa. "Our analyses show that the seeds cultivated 6,000 years ago greatly differ genetically from the wild forms we find today in the region. However, they show considerable genetic overlap with present-day domesticated lines from the region," explains Nils Stein, who directed the comparison of the ancient genome with modern genomes at the Leibniz Institute of Plant Genetics and Crop Plant Research (IPK), Gatersleben, with the support of Robbie Waugh and colleagues at the James Hutton Institute, Dundee, Scotland, and Gary Muehlbauer, University of Minnesota, USA. "This demonstrates that the domestication of barley in the Fertile Crescent was already well advanced very early." The comparison of the ancient seeds with wild forms from the region and with so-called 'landraces' (i.e., local barley lines grown by farmers in the Near East) enabled to geographically suggest, according to Tzion Fahima and his colleagues at the University of Haifa and Israel's Tel-Hai College, "the origin of the domestication of barley within the Upper Jordan Valley - a hypothesis that is also supported by two archaeological sites in the surrounding area where the hitherto earliest remains of barley cultivation have been found. Also the genetic overlap with present-day domesticated lines from the region is revealing to the researchers. "This similarity is an amazing finding considering to what extent the climate, but also the local flora and fauna, as well as the agricultural methods, have changed over this long period of time," says Martin Mascher, from the Leibniz Institute of Plant Genetics and Crop Plant Research, the lead author of the study. The researchers therefore assume that conquerors and immigrants coming to the region did not bring their own crop seeds from their former homelands, but continued cultivating the locally adapted extant landraces. Combining archaeology, archaeobotany, genetics and computational genomics in an interdisciplinary study has produced novel insights into the origins of our crop plants. "This is just the beginning of a new and exciting line of research," predicts Verena Schuenemann, from Tuebingen University, the second lead author of the study. "DNA-analysis of archaeological remains of prehistoric plants will provide us with novel insights into the origin, domestication and spread of crop plants." Page took 0.023049 seconds to load.